Waves to everyone, welcome to this weeks Read With Me. What's everyone been reading lately? I have to admit one problem I have is actually picking which book to read. I personally blame Amazon once click oh and the fact there are so many great books available on Kindle for free. My list of books to be read seems to be forever growing, I read one and tend to add five more. One of the books I managed to read last week was The Year We Fell Down by Sarina Bowen. A sweet coming of age story with a twist. It made me laugh, it made me smile and I'll admit I even cried a tad. Do click the link as it is currently free on Kindle. My favourite post from last week came from Story Snug, of course it had to be royal baby themed. The post has bloggers sharing which books they would gift to the new Princess, a lot of brilliant classics shared. Onto the link up. 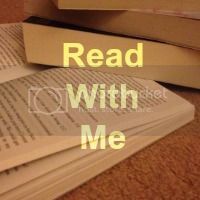 New to Read With Me? Take a look here at what it is all about. Regular? Get linking, commenting and hopefully displaying my badge.